I work primarly from photographs, which means the picture you love the best can be transformed on to canvas, it need to be clear and a good head shot so that I can capture their character, and especially the eyes which help capture their expression of joy. 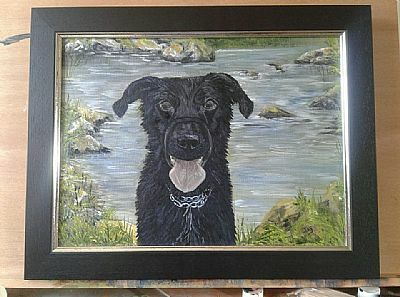 Pet Portraits make lovely gifts, they are personal, a little different and especially good for that person who has everything. Potraits take about three weeks, and I work three weeks in advance. Photographs are so much easier,to send all you have to do is either email them or private message me on Facebook.